Christmas already seems like a distant memory but some good news worthy stories get little, if any, coverage in the media and the following story is one such example of this. The journey starts way back in December 2014, when the Swans had just beaten Hull City 1-0 at the KC Stadium, a result which saw them move up to 8th place in the Premier League under the stewardship of Garry Monk. A few days before Christmas, some of the Swans playing squad had made their annual visit to the Children’s Ward of Morriston hospital to meet and hand out gifts to the children. 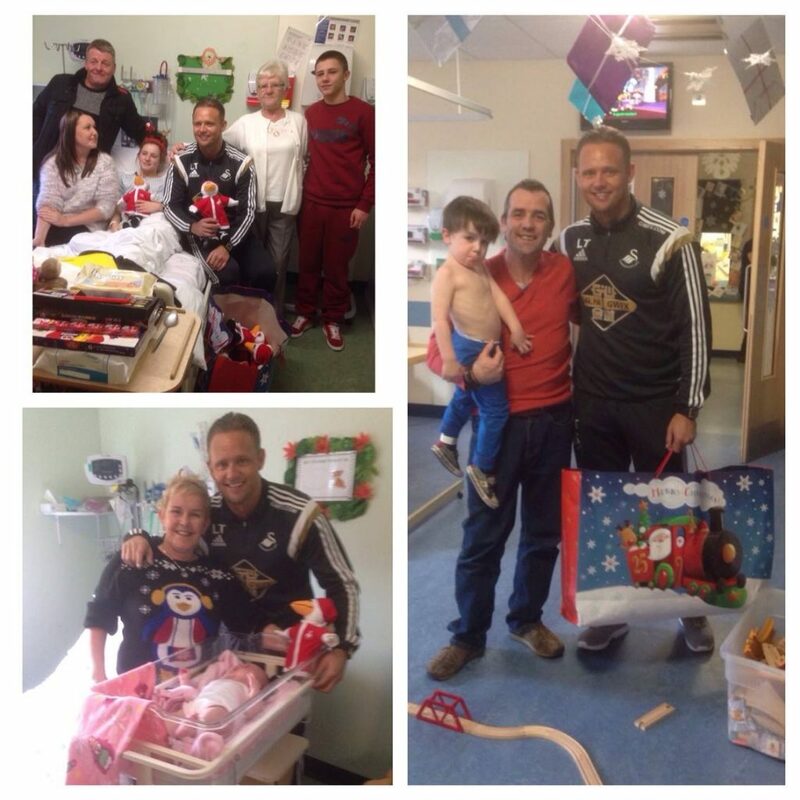 The visit prompted Swans Club Ambassador, Lee Trundle, to do something even more special for the kids, who sadly would be spending the most special time of the year in hospital. “It all came about after we had done the annual player visit to the hospital a few days earlier. We had plenty of cuddly Swans toys left and I thought about how awful being in hospital on Christmas Day must be for a kid, so it just made perfect sense to do something about it.” said Lee, in his usual down to earth and friendly way. Laden with carrier bags full of Christmas presents for the kids, and helped by the then Supporters Director Huw Cooze, Magic Daps duly visited the hospital on Christmas morning, handing out gifts, signing autographs and posing for pictures with patients, parents and the dedicated NHS staff. Every year since, Trundle and his trusty helper Cooze, have continued to visit the children’s ward in Morriston on Christmas Day, spreading festive cheer to everyone they meet and emphasizing that the real joy of Christmas is certainly in the giving and not receiving. “I just take some pictures and carry the bags,” said Huw modestly, playing down his involvement. From children and parents face-timing relatives of their visit from Magic Daps, to the nursing staff wanting a picture with their Swans hero, Trundle does it off his own back, not at the request of the football club. In fact, some of the kids were more pleased to see Lee than Santa himself! Whilst on their festive round, the duo have even met Cardiff City supporting kids and parents, whom were more than happy to have a picture taken with the man himself, even if they weren’t quite as happy with a Swans teddy bear or Cyril the Swan they received! In an age when footballers are paid excessive wages and live a movie star lifestyle, Trundle’s annual Christmas gesture is something which shows that not all players have lost touch with the fans and their local community. If only the media were as quick to publish goodwill stories such as this, as they are about misleading transfer rumours. Keep up the good work Lee and Huw, at least the people that really matter, the children, are very appreciative of your efforts every Christmas.